With blacklist I hope to turn aquarists attention toward various species that have a poor rate of survivability in marine/reef aquariums. It’s not uncommon to inadvertently end up with a specimen that refuses to feed, reacts poorly to new conditions, or simply fails to thrive within a captive environment. Some of these species are kept by advanced aquarists, or public aquariums and others simply don’t belong in captivity. Other species can survive, but require a tank of their own with very specific guidelines for aquascaping, filtration and feeding. To kick it off, I will start with the pineapple fish, a species that is very daunting to keep in the mixed reef, or fish only environment which is common in home aquariums. This is a species that requires a large tank of its own to survive, but in all reality is best left alone by anyone other than a very advanced and dedicated aquarist. Cleidopus gloriamaris is a member of the family Monocentridae, being the sole member of its genus. Some refer to it as the knight fish, or coat of arms fish, as its pineapple like scales also resemble armor plating. What makes the fish so attractive, in addition to its unusual body shape and markings, is a pair of bioluminescent organs, giving the fish’s cheeks a blue or red glow during twilight hours. In Latin the pineapple fish’s name means, glory of the sea. This species is native to coastal waters off of Queensland, New South Wales and western Australia. It has a wide depth range, starting at 20 feet and ranging down to 656 feet. Size/Description: This species has a moderate size, reaching up to 8.6 inches in the aquarium. The body is plump and round, with a series of backward pointing sharp scales. 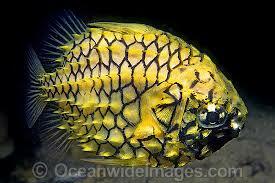 Pineapple fish have a heavily armored head, complete with rough ridges and mucus pits along a ridge of thick bone. Each mucus pit is home to a colony of bioluminescent bacteria, near the lower jaw, which are concealed when the species closes its mouth. The thick scales that cover the body are yellow to cream in color, rimmed by a thick black outline. 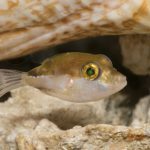 Struggles in the marine aquarium: The pineapple fish is a weak swimmer, rarely straying from one ledge. In various oceanic environments, ecologists have documented pineapple fish living on one specific ledge for upwards of seven years. Since they claim and territory and keep it, they are often harassed by more boisterous species. Being weak swimmers, this species is easy fodder for a surgeonfish, trigger or large angelfish. Being a deep water and nocturnal species, pineapple fish struggle to adjust to the bright lighting and vibrant environment created in a typical reef aquarium. The photospheres on their jaw create a mix of blue to red light (depending on specimens’ age) which begins to dim just hours after it first starts glowing. It’s believed this adaptation is used to illuminate/attract small shrimp and other invertebrates the species seeks as prey. Pineapple fish are slow deliberate feeders. Often hovering around their chosen ledge, slowly attracting live food before swimming down to grab it. Nearly any other species will easily outcompete them for food. 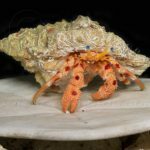 Being nocturnal, and living at nearly 700 feet of depth, they cannot withstand normal reef conditions, which causes un-do stress, and a complete lack of feeding. It’s possible that the constant stress of average captive marine conditions leads to a weakened immune system, which culminates in repeated bacteria infections. Also, it’s not uncommon to acquire a species with a damaged swim bladder or suffering from barotrauma related organ damage. 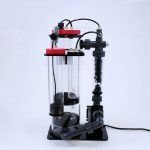 Capturing deep water fish is a tedious task, and measures must be taken to either slowly bring the animal up to surface pressure, or de-compress the fish in a hyperbaric, much like treating a scuba diver for the bends. 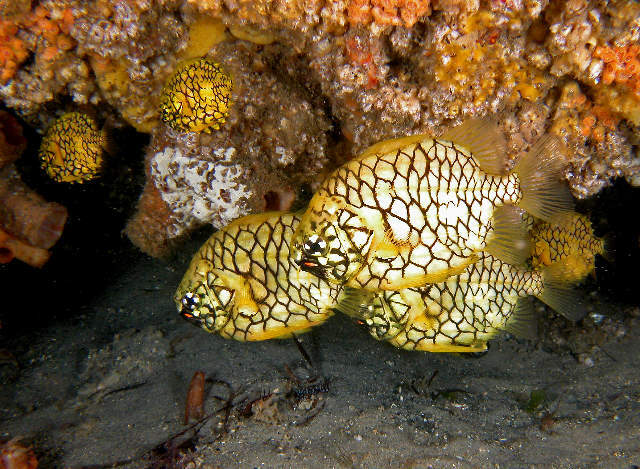 Pineapple fish usually require constant live feedings. 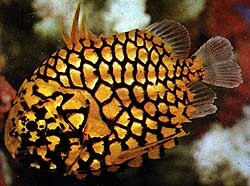 When to keep them: If the allure of a strange, glowing fish is enough to entice you, pineapple fish can be kept in a species only tank. Since they usually inhabit only a single ledge, a tank of 90 gallons + serves them well, and allows the aquarist to manage water quality. 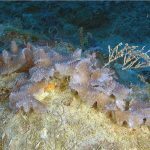 Dim lighting conditions that replicate those found in the deep sea are a must, and I favor a set-up that runs a deep blue moonlight at night, and a very subdued daylight during the day. Lighting systems such as the Ecotech Radion, which simulate deep water reef conditions work well, allowing the aquarist to observe the fish’s unique feeding behavior. In actuality, once established pineapple fish can be hardy, long-lived aquarium specimens. 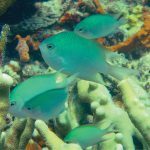 Their unique requirements, and need for a constant supply of live food, make them outside the realm of the average aquarist, and they are entirely unsuitable for someone who concentrates on keeping mixed-reef tanks. The reason they are on the black list, is simply because often an aquarist wanders into a fish shop, and sees an unusual pineapple fish swimming around, takes it home only to find it dead days or weeks later. 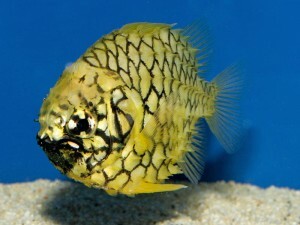 For those who fall in love with this species, and are willing to create a display totally tailored to these tricky requirements, the pineapple fish is a truly rare and unique gem, giving credence to its name glory of the sea.